I met Barbara a couple of years ago at the Canadian Authors Association’s CanWrite! Conference. Not only was she an excellent presenter and full of writerly goodness, but she was also generous with her time. Her critique of what was then my first 20 pages was an eye-opener and she sent me off with a new direction for my novel (which has shifted twice more since, but we don’t need to talk about that here). Then I started reading her Thornleigh saga and became a fan. We met up again at the Algonkian conference in Niagara Falls last year, and I’m thrilled Barbara accepted my proposal for an interview. Her latest novel in the Thornleigh saga, Blood Between Queens is available now. I would, of course, suggest that you read the rest of the series too. You’ll be hooked before the end of the first chapter of The Queen’s Lady, I promise. BK: Thanks for inviting me, Melanie, and for your very kind words. WG: Before The Queen’s Lady was published, you wrote and published three thrillers under a pseudonym. More recently, your novel entrapped, another thriller, was honoured with the B.R.A.G. Medallion. You’ve also written screen plays. What do you enjoy most about writing each genre or form? BK: The glory of the novel is that the author can get inside a character’s head and heart, can write exactly what the character is thinking and feeling, so the reader gets that precise, deeply-felt emotion, whereas in writing a screenplay you’re limited to just action and dialogue; you’re totally dependent on the actor to convey the layers of emotion. So that’s a huge difference. The wise screenwriter resists the urge to overburden the dialogue with these layers, and leave room for the actor to supply them. (It’s why we pray to have fine actors cast!) On the other hand, when it comes to describing a setting or a character’s appearance, the screenwriter doesn’t have to do a thing, because one second of screen time shows what the novelist must work painstakingly to convey, slaving over paragraphs of description that film shows in a blink. As for what I enjoy about writing historical novels and thrillers respectively, my historicals actually are thrillers. If we define the thriller as having life-and-death stakes, a ticking clock (a crucial deadline), and the protagonist pitted against a powerful antagonist, then all my Thornleigh Saga books are thrillers. Seem it’s my métier. WG: You are meticulous in your research, something I admire greatly. When you begin to work on a new novel, do you start with an idea and plot firmly in mind and fill in the blanks with your research, or is your idea/plot general to begin with and informed and shaped by the research you do? BK: When I start a book I have no plot firmly in mind; usually I have just a character who’s bent on doing something. 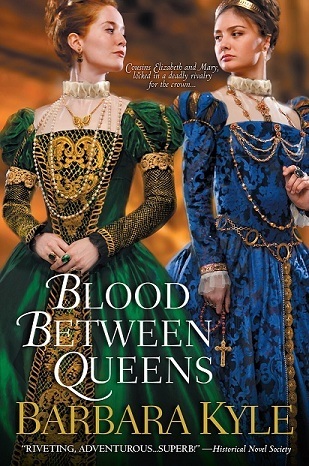 My new release Blood Between Queens is Book #5 in my Thornleigh Saga, which follows a middle-class family through three Tudor reigns. My plots in these novels are quite complex, and I develop them through several drafts of an outline, which I work on for several months while concurrently doing research, before I start writing the first draft of the book. When I talk to writers I call the outline a “storyline” because as writers we must never forget that we’re telling a story. For me, the outline is where all the heavy lifting of creation gets done: creating the characters and plot. As for research, I appreciate your compliment about mine being meticulous, because it’s so important to get the bedrock facts right, whether it’s the gate at the Tower of London through which Princess Elizabeth (later Elizabeth I) entered when her half-sister Queen Mary imprisoned her in The Queen’s Captive, or the technical aspects of an Alberta oil company drilling for “sour gas” in Entrapped. Readers love learning when they read fiction, and I love giving them the details. WG: Owing in part to your extensive research, you’re considered an expert on the Tudors. You’ve spoken at the University of Toronto and will appear at the Stratford Festival this summer speaking on the subject of the rival queens. How did these opportunities emerge for you and how are you enjoying this evolution of your career? WG: You also conduct workshops and master classes on writing at various conferences and other venues as well as making time for manuscript evaluations. How do you structure your professional life to make room for everything and still have time to write? BK: Very carefully! It’s a juggling act. Mostly, I do manuscript evaluations when I’m between books – but that window doesn’t last long because my current three-book contract with Kensington requires me to deliver a new book each year. Still, I truly enjoy teaching emerging writers. Having been one myself, I know how hungry new writers are for guidance from someone who has helpful knowledge about the process. And I love seeing a writer experience a “light bulb” moment from something I’ve taught. That satisfaction is priceless. WG: You’ve just completed a blog tour in celebration of Blood Between Queens. How do you find social media has changed the way books are published and promoted? Amy lined up fifteen blog hosts who asked for guest posts from me and/or interviews. Several of them also offered a giveaway of the book. The tour lasted three weeks and was a great success, with over 700 people entering one of the giveaways. WG: Now that the blog tour is over, what is next for you and Blood Between Queens? BK: Well, it’s only been out for five weeks, so I hope many more readers will be intrigued to pick it up! And I’ve just finished writing the next book in the Thornleigh Saga (Book #6) which carries on Adam Thornleigh’s story where Blood Between Queens left it. I won’t give any spoilers, but I can say that it’s set in 1572 and Adam joins the Dutch rebels who called themselves the Sea Beggars in their real-life fight against their Spanish occupiers. (I liken them to the Resistance in World War II fighting the Nazis.) Now, I’m deep into the research for Book #7. So there are lots more adventures of the Thornleigh family ahead. By the way, each “Thornleigh” story stands alone. To enjoy one book, a reader doesn’t have to have read any of the previous ones. BK: Thank you, Melanie. I sincerely wish you the same. Justine Thornleigh is delighting in the thrill of Queen Elizabeth’s visit to her family’s estate when the festivities are cut short by Mary’s arrival. To Justine’s surprise, the Thornleighs appoint her to serve as a spy in Mary’s court. But bearing the guise of a lady-in-waiting is not Justine’s only secret. The weight of her task is doubled by fears of revealing to her fiancé that she is in truth the daughter of his family’s greatest enemy. Duty-bound, Justine must sacrifice love as she navigates a deadly labyrinth of betrayal that could lead to the end of Elizabeth’s fledgling reign . . .
“A beautifully written and compelling novel. 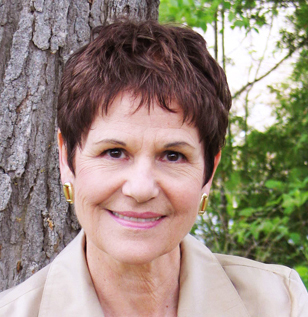 Again, Barbara Kyle reigns!” – New York Times bestselling author Karen Harper.